Learn to effectively school your horse on the flat - ​Prepare for your show jumping and cross country course. 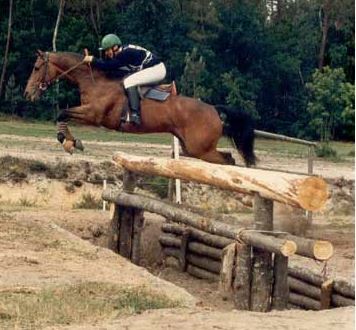 As a graduate of the National Riding School in Saumur, France, Pierre has competed in Eventing and has worked for many years with show jumpers in France, Switzerland, California & New York. He has made a significant impact with jumpers and event riders by improving their flat work to create a more balanced and well rounded athlete. He understands what is needed to prepare a horse for the athletic challenge of becoming a show jumper or event horse but explains that the basic biomechanics are still the foundation for any discipline. No matter if you want to move on to Jump, Cross Country or do Classic Dressage. Only a horse that knows how to properly engage and that can be rebalanced easily will have the fitness, muscle development and technique to successfully and safely navigate through a course. The dressage test is gaining importance and placing well in your test is giving you a huge advantage over your competition. Both use the same principle and philosophy. At the beginning they are exactly the same. The goal is to teach the fundamentals, the foundation, the correct biomechanics and basics that will prepare the horse for any discipline. A dressage horse or a jumping horse should be able to perform equally the same basic work. Dressage or Flatwork is the starting point for all discipline where the rider teach the skills necessary for his horse to start a specific discipline. Like pure dressage, jumping or eventing. When the horse has reached with a certain success a solid level of dressage, and his rider has decided which discipline is the better fit for his horse, the dressage starts to specialize. For example: In pure dressage the riders goal will be to collect his horse more for piaffe, passage and collected gaits in general. In jumping the dressage or flatwork, will be more towards a jumping course that will require less collection but more challenging issues like jumping fast, in a good form, turning sharp and doing a clear round in the best time possible. At this time the goal for dressage and jumping is going a different direction. ​The dressage or flatwork for jumper must be adapted to the new challenges but like pure dressage, the principal will stay the same. And this point dressage becomes flatwork for jumpers. Pierre is available for trailer in lessons or clinics at your barn.